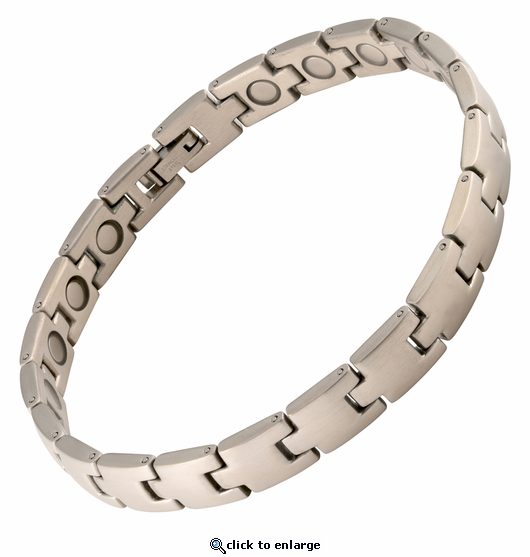 This is a matte silver solid stainless steel magnetic bracelet that many people enjoy. This magnet bracelet is medium width at about 1/3" wide and has a large 3300 gauss neodymium rare earth north facing magnet in each link. This bracelet is very attractive and works great relieving the pain in my hand and wrist. I had my right hand reconstructed some years ago and since, it has developed calcium deposits and bone spurs. It was quite painful, but my stepping stones bracelet has helped tremendously in relieving the pain. It makes my job much more pleasant. I wear it all of the time. Thank you! ive had leg cramps every night for several years now. There is nothing a Doctor can suggest to get rid of it. I've been taking magnesium 6 to9 tabs a day, which help a little. Its been costing a lot every month. I ordered magnetic bracelet by accident. But i went ahead and used it. I was surprised I didn't have leg cramps on the first night, 2nd and going over 2 months now. I just had a leg cramps twice. This is a blessing for me because i can't find anything to cure it. tnx so much. Went about a week without a magnet bracelet and had to take a pain reliever daily until this one showed up. Purchased this one as a replacement. Once on, the pain in my forearm lessened considerably. I leave it on 24/7. I work in a kitchen (and have for almost 20 years) so my wrists and arms endure a lot of repetitive motion. So far this bracelet is working great, very durable and fits perfectly. I instantly felt the bracelet working and was really happy that it relieved the 3 month long pain I've had in my left wrist, elbow, shoulder. I'm not yet 100% free from discomfort, but I'm hoping that over time, it will continue to improve. The bracelet has worked better than acupuncture and deep tissue massage. Thanks Magnet Jewelry Store! I appreciate the results this bracelet has given me. My right hand has arthritis and the outcome wearing this stylish bracelet has helped in the pain to be relieved. I would give you a 10 if possible. But your 5 shows you how much I like your product. I am an active outdoors-man, and have owned other magnetic bracelets with the bead to bead clasps. One is in the woods and one is at the bottom of the lake. I saw the watch band style clasp on this bracelet and knew this one is staying on! My only negative is that I wish you had one in black or gun-metal finish. This bracelet has worked wonders with my chronic back pain. I admit that I was a little skeptical at first that it would make a measurable difference in the amount of pain in my back, but it has worked wonders for me. For the price, I highly recommend trying one if you have any kind of chronic pain. This is a very good Mens bracelet. I have it on now and hardly ever take it off. Fits perfectly!! I was willing to try anything to lessen the pain in my hip and leg. Right away I felt a difference. For 2 weeks now I have walked without limping and I am not in as much pain. I seem to have more energy and I sleep better. I have told other people about my experience and several of my friends have decided to give it a try. I know this is not a cure but I am just happy to have some days without pain wherever it comes from. After purchasing another bracelet from MagnetJewelryStore, I was so impressed by their customer service and the craftsmanship of the bracelet, i decided to get one for my other wrist. The first one fit a tad bit too large so I decided to get this style with a little smaller link. It fits perfectly!! There are more magnets as there are more links. I am VERY pleased with my purchase. The bracelets are comfortable, affordable, and look great. Although I've tried other treatments such as therapy, which included melted paraffin/icepack plus acupuncture, this magnetic one is the first to noticeably lessen the pain. This bracelet looks great. I was very impressed with the quality and quickness of shipment. The cronic pain from tendonitis has lessened and keeps getting better. I'm so glad i tried this product; not disappointed.